Forgive me for being late to the party, but I've just started watching NBC's The Office on Paramount. Because they're showing two episodes a night and the first season is only six episodes long, I have missed the entire first season and came in at the fourth episode of season two. I liked it just fine; the characters are pleasant and the whole show is less cringey and comedy-of-embarrassment than the original version, so the fact that I wasn't laughing at it didn't bother me. Last night, though, they showed "Take Your Daughter to Work Day", and either the characters have finally clicked with me, or it was genuinely a much funnier episode, because I laughed until I was almost sick. It feels a little like when The Simpsons finally realised that Homer rather than Bart was the star of the show; The Office seems to have figured out that, unlike the British version of the show, the will-they-won't-they relationship and the overpowering manager figure are not the centre of the show. 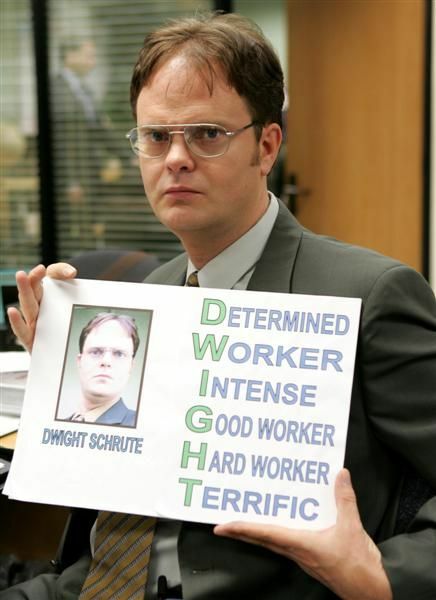 The centre of the show is Dwight. I hope it keeps up like this. Also, the great thing about watching it on Paramount is that I'll be able to catch all the episodes I missed when they run them again in a couple of weeks time. The only thing is that you can never, ever sit through the ad breaks on Paramount unless you want to see the same ad for Everybody Loves Raymond, That 70s Show, or some random bloody Lee Evans or Al Murray thing over and over again, every break, every show, forever.